As you can see this was the coolest trip ever! For those of you who haven't heard me rant and rave about this trip, Heritage Tours is a church history trip for graduated seniors. I went almost a whole year ago which is insane to think about. 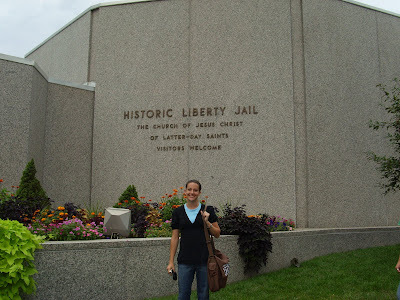 You also visit some historical sites that aren't specifically the church's, but are still fun. 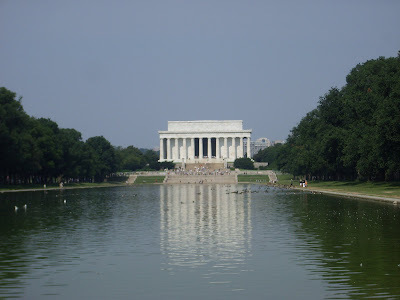 Plus you get to spend one day in NYC and one day in Washington DC. For some reason, the format isn't allowing me to say what everything is. I have two videos from tour that I will be posting soon. I couldn't have made a better decision than to go on this trip. 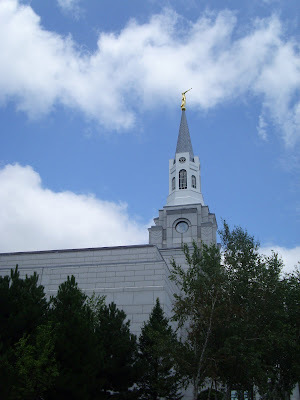 I learned so much about the Church, strenghtened my testimony, enhanced my writing abilities (I wrote a poem for each place we visited), made awesome friends, and so much more. It was a blast! 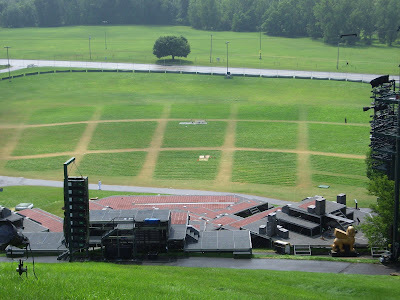 This is what the Hill Cumorah Pageant looks like from the top of the hill. We walked up there the day after we saw the pageant. Cool huh? 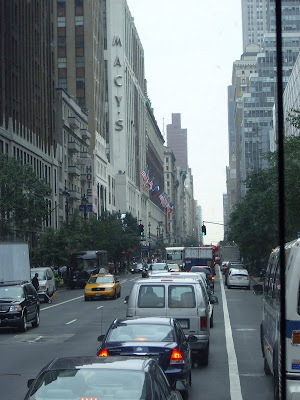 Shopping in NYC. If you know me, you know I hate shopping for extened periods of time. 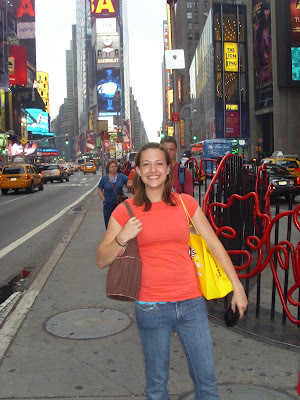 But I endured shopping in New York pretty well. It was fun, but too full of smoke and crazy drivers. The first sight of New York City coming out of the tunnel. Some people on the bus tried to hold their breath the whole way through the tunnel. Not the brightest idea. Me and my best friends Abi and Ariel in front of the Boston Temple. So pretty! I loved it. A picture of Matt and I. 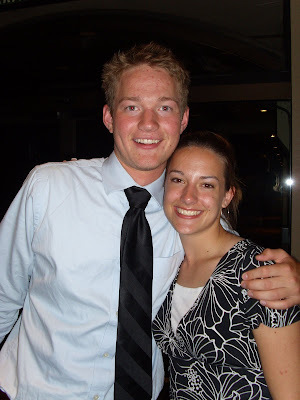 He is one of my best friends from High School. He's in Oregon right now saving money for his mission and I miss him! 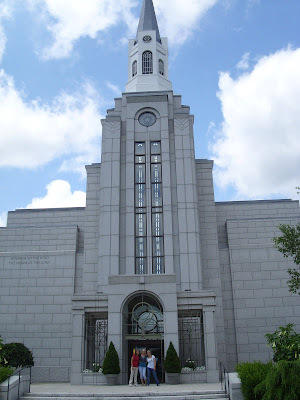 A different shot of the Boston Temple. This view is actually from the parking lot. Another picture of Matt and I.
Lauren Taggart and I on the last night of the tour. We both had been crying. I knew her in high school, but we weren't really friends until tour. She's awesome! A view into the Sacrd Grove from the Fence surrounding it. 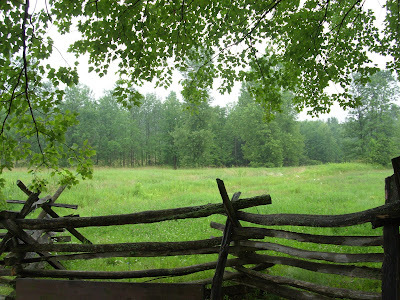 I like to imagine that this would be similar to the fence Joseph Stumbled over from exhaustion the day he had the First Vision. 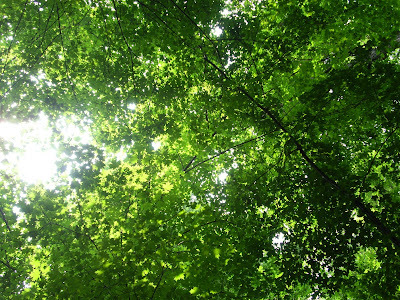 A sky shot from th Sacred Grove. It was amazing how the light worked with me. :) I love this picture. 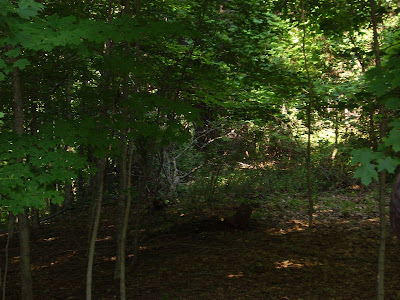 When we got to the Sacred Grove, they had us all go in alone and find a secluded place to read our scriptures, etc. 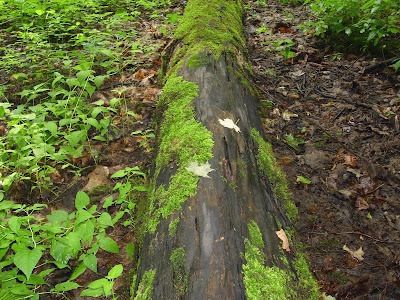 Fortunately I had a blanket to put on top of this log because it had been raining all day long and the moss wasn't scarce. I LOVE this picture! 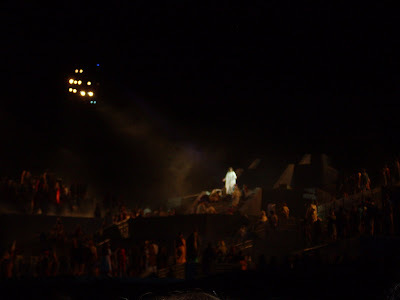 This is from the Hill Cumorah Pageant at the scene when Christ comes to the Americas. I was bawling at this point. 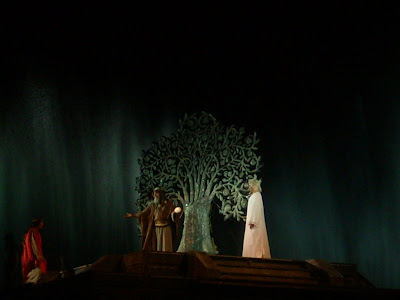 Again, the Hill Cumorah Pageant, but this is the Tree of Life scene. Skit night. The last night. I had just totally butchered my line and Abi was laughing at me while I was trying to keep my cool. 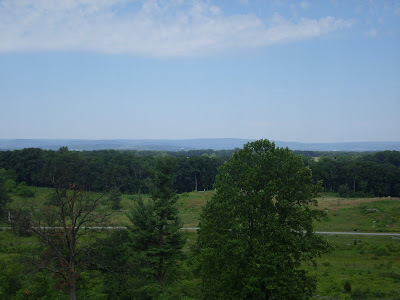 I can't remember where this was for sure, but I want to say it was either in the Kirtland Visitor's Center or Palmyra Visitor's Center. 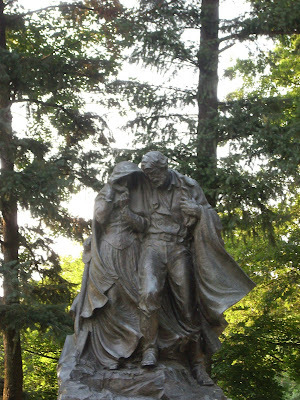 This is a statue at Winter Quarters. 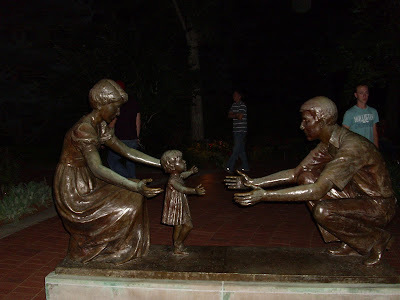 It depicts a couple burying their child on the way to the Salt Lake Valley. 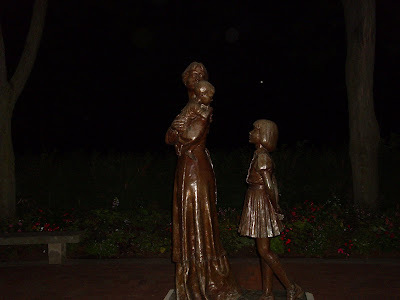 You can't really see it, but the statue shows the grave of the child too. 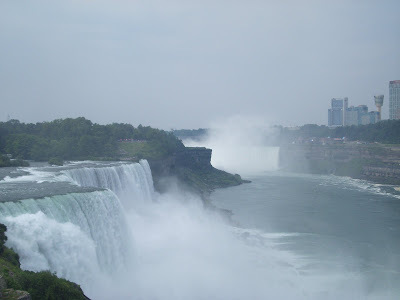 Niagra Falls! I'm so proud of this shot! You can even see "The Maid of the Mists" which is the boat that takes you on the water. That is so much fun. Another shot for my photography hall of fame. 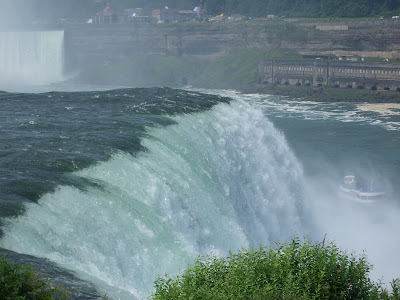 But it's not like it's hard to get a good shot of Niagra Falls. It's beautiful! 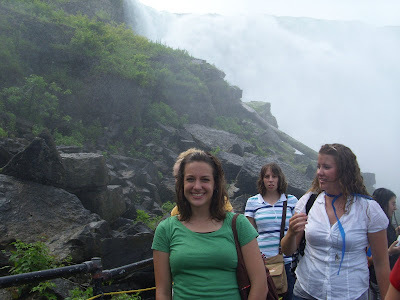 Standing by the Falls. You get a bit wet. 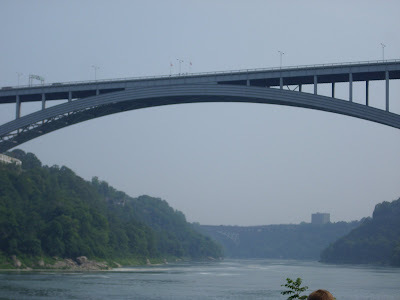 The bridge over the Falls. It's a long walk up there from where I took this picture. Trust me. 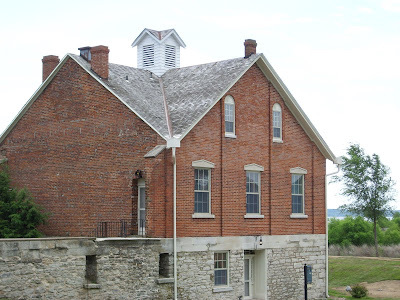 This is a picture of Adam-Ondi-Ahman. The night before we went there, the fire alarm in our hotel went off at 4:00 am and didn't turn off until right before we left for the site. Being my hard sleeping self, I was able to go back to sleep, while everyone else was not so lucky. 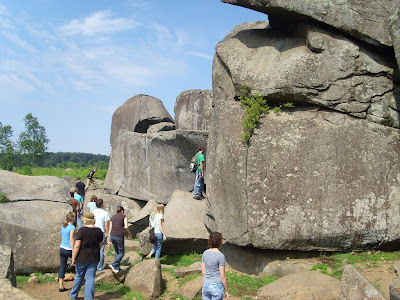 Most of us were pretty grouchy that day, until we went to Adam-Ondi-Ahman. It had also poured rain all night long the night before and was still pouring on our way to my favorite church history site. 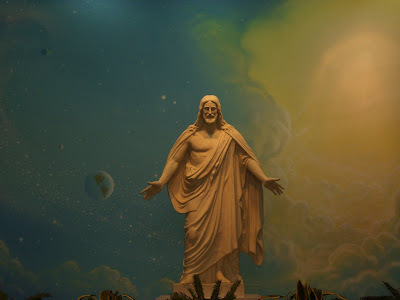 Then, Brother Toone, the man in charge at the time, asked someone to say a prayer that we would have good weather and be able to enjoy our time there. The rain didn't stop until the minute we got there. 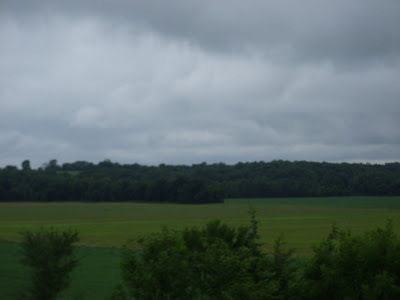 We were encircled by a ray of sunshine and everywhere around us, just on the outskirts of the place, were gray clouds and rain. It was amazing. I tried to show that by this picture, but could never do that moment justice. 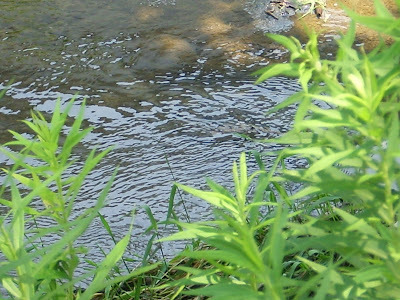 This is a stream in Nauvoo. I thought it was a pretty picture. 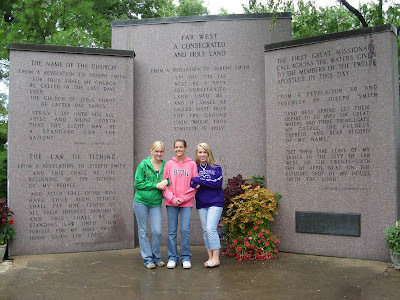 The memorial at Far West with Abi and Ariel. 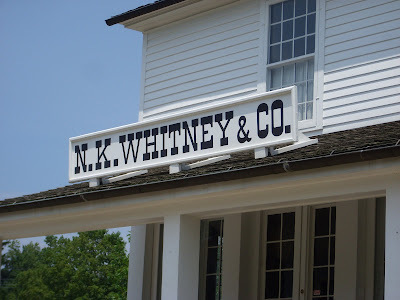 The Newell K. Whitney store. "Thou art the man". Love that story. 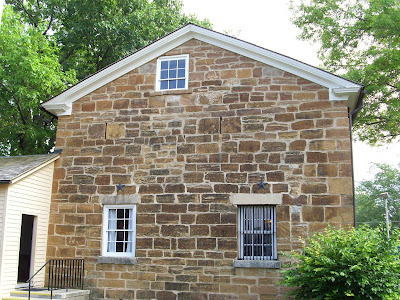 Liberty Jail. I loved going there. 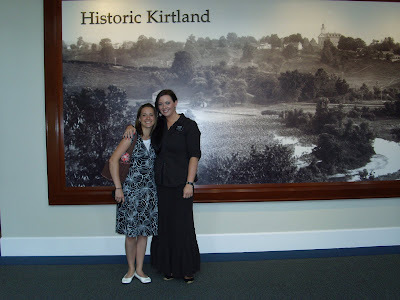 I ran into an old friend at the Kirtland Visitor's Center. Laura Packer! Love her. 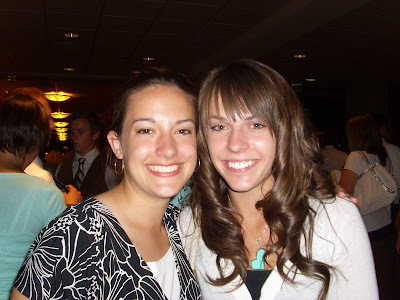 She was serving her mission there at the time. 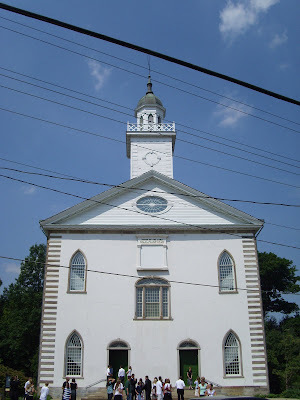 The Kirtland Temple. I couldn't get a picture without the stupid telephone lines. Oh well. 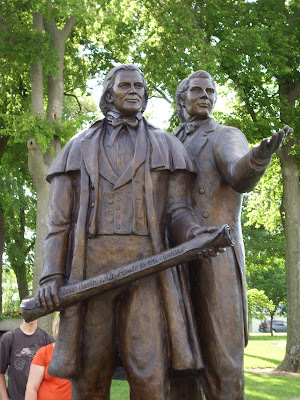 The Christus Statue at the Nauvoo Visitor's Center as far as I can remember. 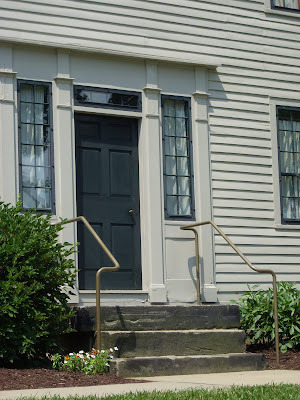 The doorstep of the John Johnson Farm. That was one of my favorite places. 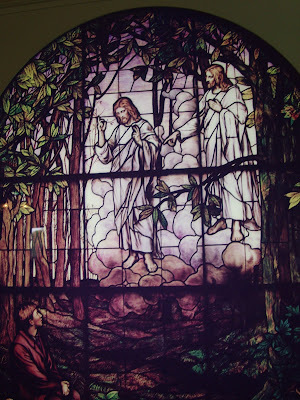 The entrance of the Sacred Grove. 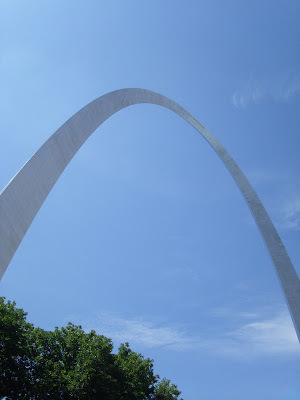 The St. Louis Arch. That was one of our rest stops. We were only there for about an hour or so. 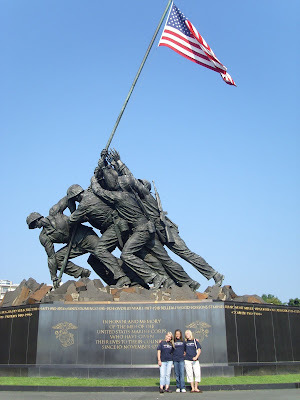 The Women's Monument. 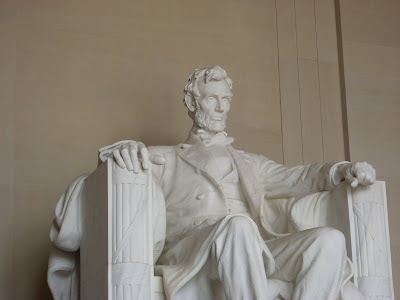 This was one of my favorite statues. Another awesome statue at the Women's Monument. We arrived there at 9:00 pm and left around 11:30. We were tired, but it was so worth it. We had a testimony meeting about our mothers. 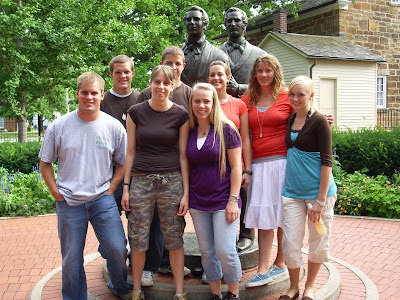 A "family" picture outside Carthage Jail. We were split into groups that they called families. 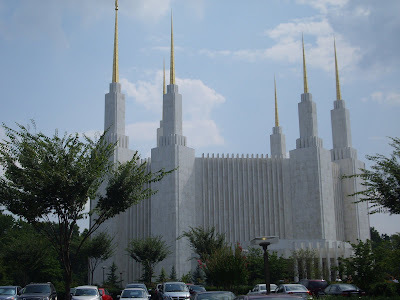 This is the Washington DC Temple. So pretty! 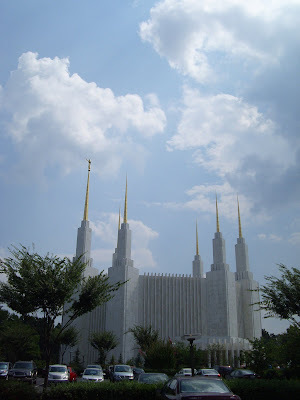 I loved seeing some of the Temples along the way. Oops! Repeat. My bad. Still pretty! 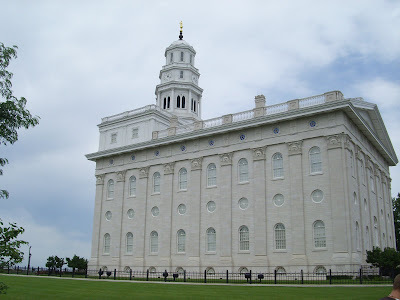 This is inside the Brigham Young Home in Nauvoo. 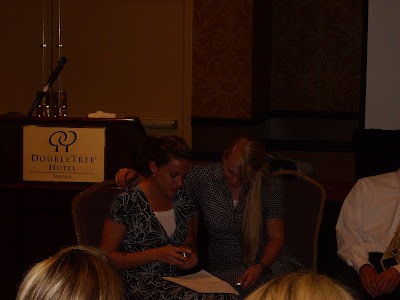 That is where I met Jana Jones, my sister-in-law's older sister. 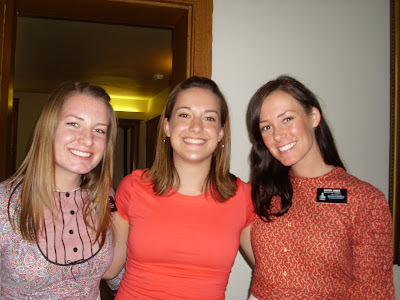 She was serving her mission there when I went, so I asked a sister missionary if she knew where she was and she told me. 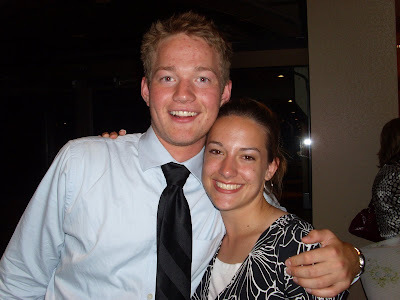 Kind of funny to introduce yourself (when meeting someone for the first time) as "your sister's fiance's sister". I love her though. She is so nice! Her companion was nice too. She gave us the tour. Jana is on the right. 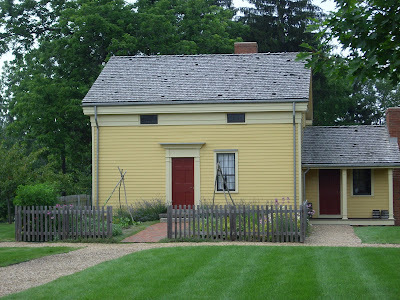 The Nauvoo House in Nauvoo. I took this picture for my dad because he named the apartment complex that he just sold after this place. 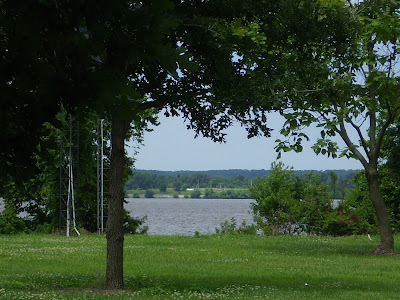 A view of the Mississippi from Nauvoo. 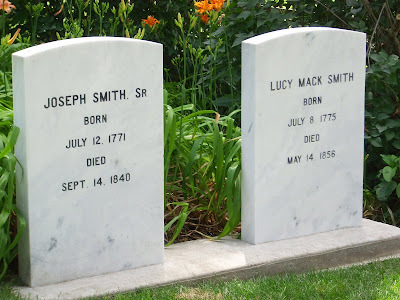 Hyrum, Joseph, and Emma Smith's graves. 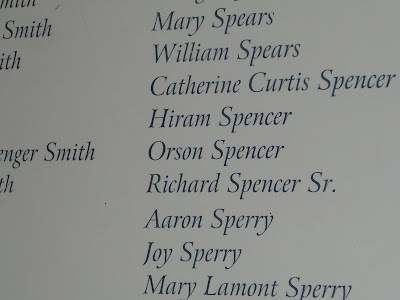 For the readers who are related to me, the people with the last name Spencer are our ancestors. 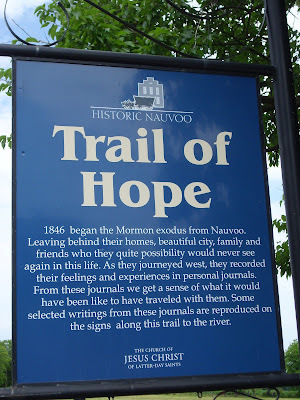 I thought it was cool that I found them at the historical landmark in Nauvoo. 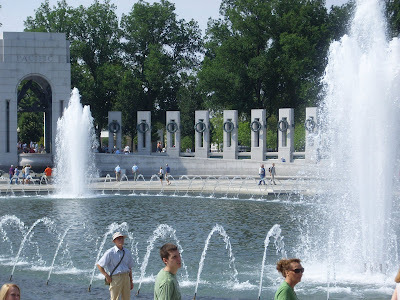 Cool fountain outside the Lincoln Memorial (I think). 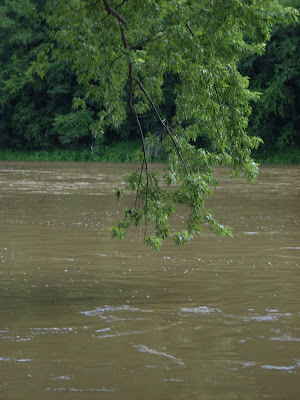 A picture of the banks of the Mississippi in Nauvoo. I took this one to go along with a poem I wrote. Me, Abi, and Ariel...classic trio. 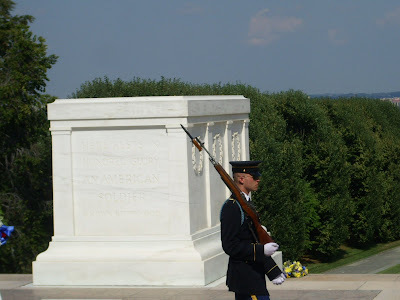 The "Changing of the Guard" at Arlington Cemetary. So cool. 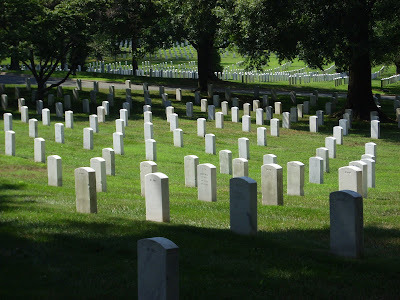 Everyone is so silent and respectful. I can't remember who's house this was for sure. Sorry! Maybe I'll remember later. Skit night again. We basically tastefully and politely made jokes about some of the hard things on tour. We took turns making the wake up calls and whenever it was your "family's" day, the rest of the tour didn't like you much. Haha. The lines for the bathroom at rest stops were unreal! There were 100 people so you can imagine how long the girls had to wait. The boys were lukcy. I can't remember where this was, but it's pretty. man I should have done this post right when I got back so I could have had a fresh memory. Abi, Ariel and I (from left to right) on the tram taking a tour of Arlington. 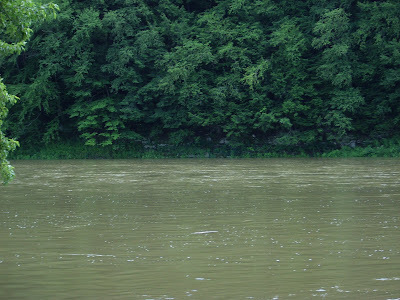 The Sesquhanna River where the Priesthood was restored. 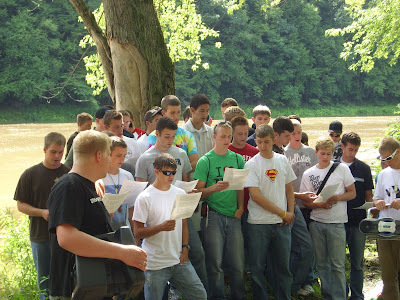 The boys on tour sang a song about the Priesthood to the girls here. 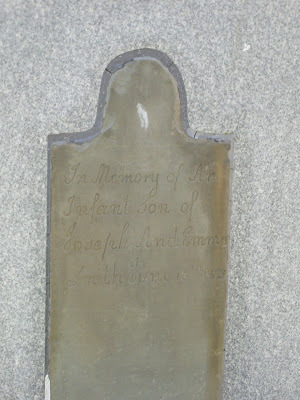 One of Joseph and Emma's children's graves. 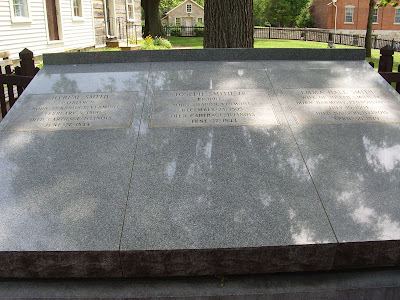 If I remember correctly, this grave was in the same cemetary as Alvin Smith's gravesight. 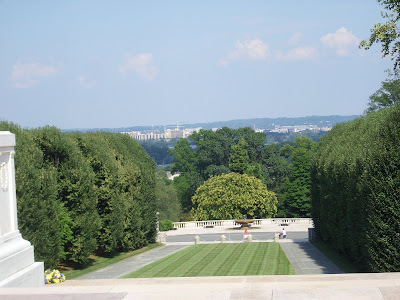 The location of the Changing of the Guard at Arlington Cemetary. A portion of the group. For some reason, I don't look too happy to be there, but it was actually really interesting. I'm in the white shirt and black hat. 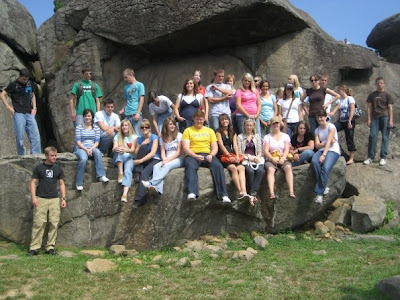 Hey I'm in one of those pictures :) I wish I would have known you back then and hung out with you. I would have had more fun. But I agree, HT was amazing!! 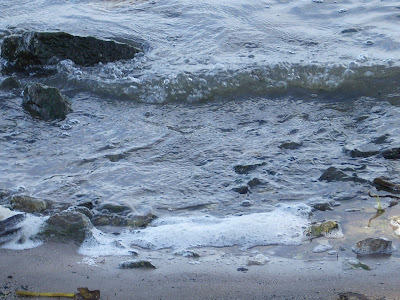 Great pictures Christine! That must have been an awesome trip. Thanks for sharing them with us!